The Judge is an American drama that follows the story of Hank Palmer (Robert Downey Jr.), a big city lawyer who returns to his childhood home after receiving news of his mother’s passing. During his visit, Hank’s father, the town’s judge Joseph Palmer (Robert Duvall), becomes the lead suspect in a hit and run. Hank sets out to discover the truth and, along the way, reconnects with his estranged family. The Judge is an emotional piece where one’s role as a son, father, grandparent or grandchild is put into perspective. The film underlines family, memories (good or bad) and how much we all sometimes wish life were timeless. An ensemble cast of supporting actors to include; Vera Farmiga, Vincent D’Onofrio, Dax Shepard, Billy Bob Thornton and Jeremy Strong gave impeccable performances, showing how easily lives are intertwined in the film’s small town setting of Carlinville, Indiana. Moments between Dale Palmer (Jeremy Strong) and his cast of brothers offered light comic relief that one could only appreciate and would see in bits of “Jack” (1996) or “I am Sam” (2001). 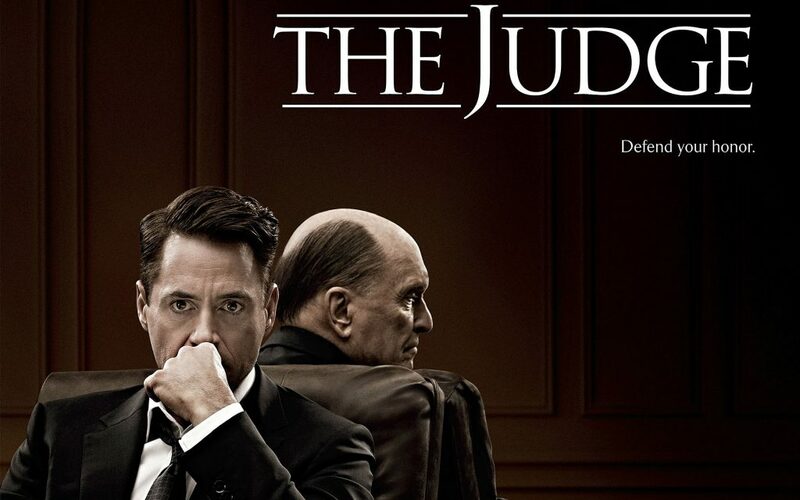 However, the heartfelt yet troublesome relationship between Hank (Robert Downey Jr.) and Judge Palmer (Robert Duvall) made “The Judge” an emotional roller coaster worth riding. Their relationship depicted the validity of human flaw regardless of success, power, rich or poor and will resonate with many who lacked relationships with their fathers. Robert Downey Jr. showcases his true talent as an actor, playing what is – in my opinion one of his best performances since “Chaplin” (1992). Robert Duvall seals the deal in one of the most realistic performances I’ve ever seen which has garnered much acclaim this award season and a Best Supporting Actor nod by the Academy of Motion Picture Arts and Sciences. The film was beautifully shot by cinematographer Janusz Kamiński known for his work in “Lincoln” (2012), “War Horse” (2011), “Saving Private Ryan” (1998), and “Schindler’s List” (1993) just to name a few. Music composed by Thomas Newman known for solidly works such as; “Skyfall” (2014), “American Beauty” (2000), and “The Shawshank Redemption” (1995). The tone of The Judge is a solid and consistent one if I may say. The film reaches out making any person want to embrace their son, or father – deeply touching. Overall, David Dobkin directed an outstanding peace for his debut in a drama!